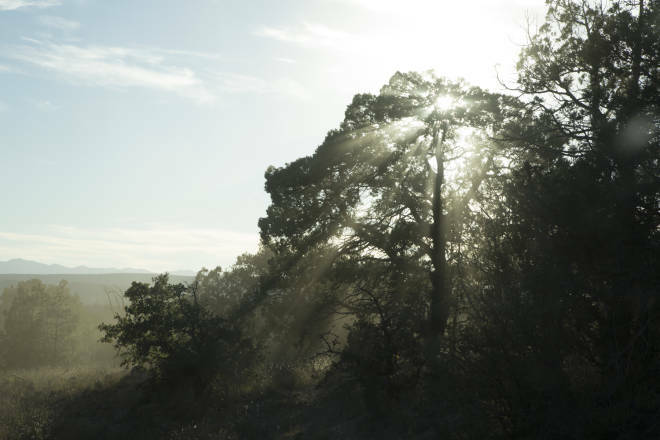 Above: The foggy wild of the Gila, shot by Gabriella Marks, from "The Wild Heart of the Gila," which won an award of merit in the Travel Feature category. New Mexico Magazine staff and freelancers won eight editorial and design awards Monday evening at the awards ceremony for the International Regional Magazine Association, the final event of the group’s annual conference in Denver. New Mexico Magazine competes in the categories for publications with more than 35,000 readers, including Arizona Highways, Texas Highways, and Down East magazines, among others. The awards honored work published in 2017. Among the awards, managing editor Kate Nelson hit a triple with three wins, including a silver award for Magazine Writer of the Year for a body of her work; another silver in the Historic Feature category with “Keeping the Faith,” a story about a legacy church near Navajo Lake; and bronze in the Art and Culture Feature category for "The Ride Stuff,” a story about a Carlsbad saddle maker. In the Profiles category, art scholar, book author, and freelancer writer Carmella Padilla won silver for “The Godfather,” about legendary New Mexico author Rudolfo Anaya. Freelance writer Will Grant won silver in the Nature and Environment Feature category for “Valley of Life,” about New Mexico’s Valle Vidal; plus an award of merit in the Travel Feature category for “The Wild Heart of the Gila,” about the Geronimo Trail Guest Ranch. "We&apos;re extremely proud to work with these incredibly talented photographers and writers in New Mexico," said Executive Editor John Clary Davies. "These award winners are just a sample of the deep well of rich stories our state has to offer." Founded in 1923, New Mexico Magazine is the nation’s oldest state magazine. It celebrates New Mexico’s alluring travel and lifestyle offerings, including our distinctive history, culture, cuisine, arts, events, hospitality, and outdoor attractions. Published monthly, it operates as a financially independent nonprofit arm of the New Mexico Tourism Department. To subscribe, go here. For more information, contact Executive Editor John Clary Davies at 505-231-3759 or john.davies@state.nm.us.